We understand that some people have more understanding of the phrase “behavioural advertising” than others. This website has been put together in the hope that it will be understandable to people at all levels. Put simply, behavioural advertising is a practice that is based on internet browsing activity and allows brands to deliver adverts to web users which reflect their interests. It’s safe, transparent, and designed to empower you, the consumer. This website will provide you with a full explanation of your online choices as well as allowing you to opt out of behavioural advertising. Imagine you are planning a holiday to Rome. 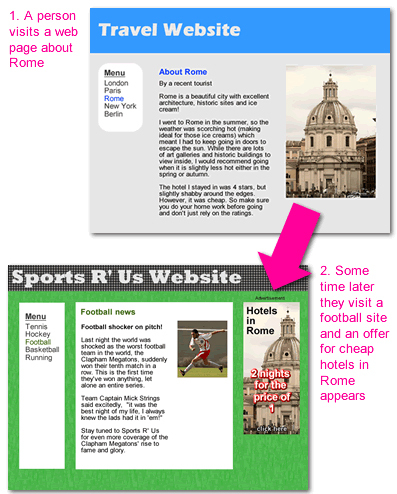 You visit a website’s section on Rome and view a few articles about places to stay and visit. On a future visit online, while reading an article about your favourite football team, you see an advertisement for a 2-for-1 dinner in Rome or an offer for discounted car hire in Rome. You receive these specially tailored adverts because you, and other people like you, have shown an interest in Rome. This can enhance your web experience by making the most of the technology only available on the internet – helping reduce the number of ads that aren’t of interest to you. This form of targeted advertising is based on someone’s past browsing activity which is why it is commonly referred to as online behavioural advertising. As it is based on past browsing activity, online behavioural advertising differs from other forms of online advertising such as contextual advertising. Contextual advertising is based on the web page you are looking at, at that particular moment. You can control which cookies you accept or refuse. The company collecting and using the data will also have a way for you to decline behavioural advertising. Click here to opt out of behavioural advertising. Our frequently asked questions should help provide answers to any other questions. We have also suggested five top tips to help you better understand and protect your online privacy.